and became an official FAI provisional class on 1 January 2012. F5J was elevated to full official status at the 2016 CIAM Plenary Meeting effective 1 January 2017. A good resource for F5J (particularly in the USA) is www.f5j-usa.com. 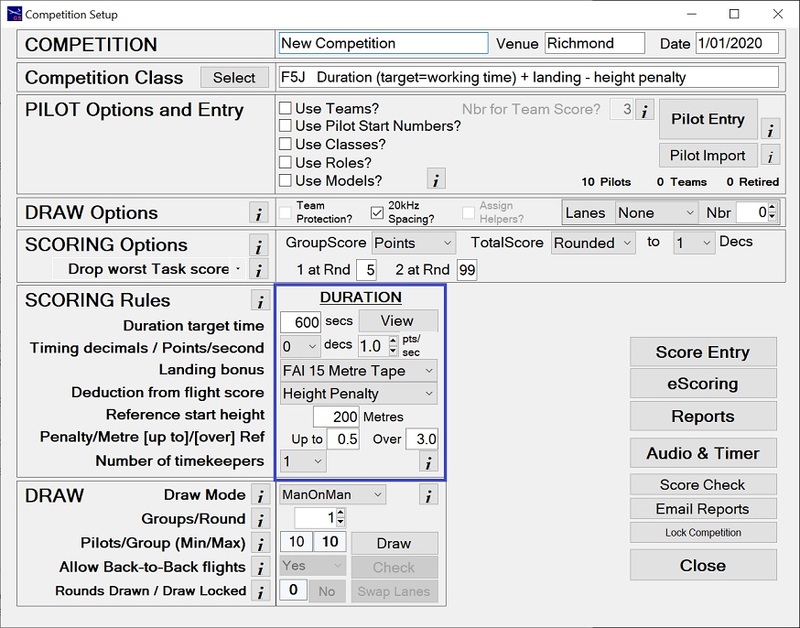 GliderScore 6.23 (and later) has the features to run F5J competitions. F5J is like F3J but with electric powered models. the moment the model leaves the launchers hand until 10 seconds after the motor is stopped." The height penalty is based on a reference height of 200 metres. 0.5 points per metre is deducted for start heights up to 200 metres. 3 points per metre is deducted for start heights above 200 metres. As an example, a start height of 201 metres would incur a height penalty of 103 points. There is no penalty for motor run, but there is a specified maximum motor run time. With GliderScore the reference height and penalty points per metre can be changed for local competitions. Click to view and/or save the official FAI F5J rules (2018 Edition). Reference height and penalty points per metre can be changed if required. Deducts (safety) penalties from the final score. Where a time or landing score is entered, validates that a height has also been entered. - time score is based on the target time. Expand F5J on the side menu to work through these features. Watch the Comp Setup F5J video.